Lani Belcher won K1 5000m silver for Great Britain while the K4 500m women also qualified their boat for Rio 2016 at the Canoe Sprint World Championships in Milan. Belcher and Angela Hannah's K2 500m boat also provisionally qualified for Rio pending official confirmation. But Olympic champion Ed McKeever only managed eighth in the K1 200m B final and still needs to qualify. Belcher finished almost four seconds behind Maryna Litvinchuk of Belarus. "I'm pleased to come away with a medal although it would have been nice to get the gold," Belcher said after taking the only medal for GB's Olympic canoeing team. "I think we've had an up and down regatta, to be honest. "For the girls the main focus was to come away with six athlete quota places. "We've definitely got four so we're hoping to get those other two as well." McKeever would have sealed a place in Brazil had he won his B final. "It's really frustrating because training over the last few weeks has been really good," McKeever told BBC Sport. "It's difficult to explain. I felt a bit flat. I was motivated but just didn't perform." Canadian paddler Mark de Jonge defended his K1 200m world title in the A final. McKeever's result in Milan means the 31-year-old must come first or second in next May's European qualifiers in Duisburg to secure an Olympic place. "I've got to go there and prove my worth and come away with a good result," he said. "I'm more than capable of doing that. "Watching the A final there was tremendously frustrating but hopefully that will drive me on and I'll come back stronger next year." On Saturday, Liam Heath and Jon Schofield qualified a boat in the K2 200m. The K4 500m boat of Rebii Simon, Jessica Walker, Rachel Cawthorn and Louis Sawers sealed GB's second confirmed spot at the Rio Games with a fifth-placed finish in their final. 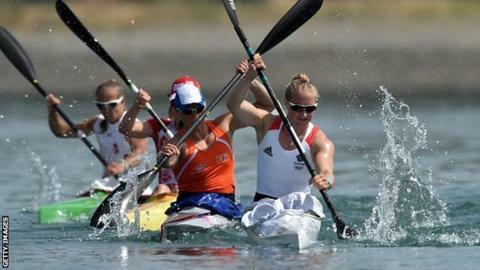 GB's women's K2 500m was provisionally qualified as other athletes in their final also qualified places in larger boats. Nations whose athletes qualify in multiple races can only take up one Olympic place in the larger boat event. Their vacated spots are then allocated to other countries. The regatta was more successful for the Paralympic squad who won two golds and five silvers as well as qualifying four boats for next September's Games, where canoeing makes its debut.